There are two(2) methods to making sure that a new surface will bond correctly. 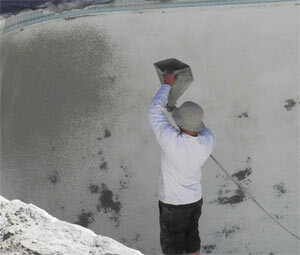 Stripping the pool's surface before plastering or sandblasting followed by applying a synthetic bonding material. Stripping a pool surface before plastering. In more than half cases, it is well advised that the surface should be removed rather than just sandblasted. 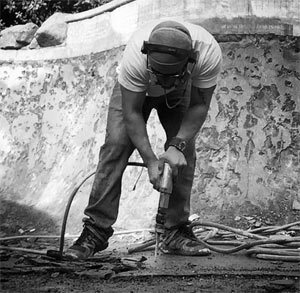 Sand blasting, and the use of a synthetic bonding agent may not be effective for a permanent adhesion for the new surface. Though solid and bonding at the time of completion, the underlying original surface may continue to deteriorate, causing the new surface to eventually pull away with time. While getting an estimate, the contractor should be able to distinguish which method should be used. Since a stripped out surface offers a lifetime warranty for adhesion, you may want to spend the extra money, and have him go the extra mile, as he would be plastering over the original gunite shell. Stripping the surface with small chipping hammers does take more time to do, entails expensive equipment, and the surface to be overlaid does take more material for coverage. So expect to pay more than a competitor that isn't. Sandblasting, and bonding with a synthetic. For bonding purposes, Synthetics have gone a long way in our industry. I have done thousands of pools using this method. 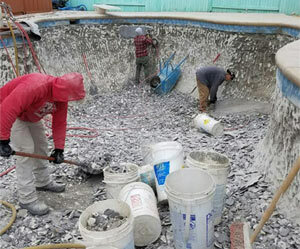 To insure a pool will bond for a very long time (using a synthetic) it is important to make sure the contractor has an experienced eye while inspecting the pools surface. There are specific clues that will help determine that this method is practical, economic, & the correct approach. Also, having a well trained crew that is conscientious, and uses good quality materials are other major factors. Keep in mind, that synthetics are made and manufactured. There is always a possibility of human error. So make sure all products are backed with warranties. I would say that a contractor would not use a synthetic if he himself is weary. Unfortunately, some will do so in any case. These are reason why a contractor would use a synthetic when his conscious says otherwise. May not have the proper equipment. May not have the proper experience. May not have the proper labor.